We're periodically posting short profiles that will collectively provide a starting point for an exploration of international blogs, online magazines, and pages. We began by looking at Kilele, We Take Pictures Too, Arab Image Foundation, Greater Middle East Photo, Space Cadet, Street Level Japan, Kantor Berita MES 56, Japan Exposures, Invisible Photographer Asia, my new notebook, oitzarisme, La Fototeca, ZoneZero, Panoramica Galerie, reminders: I WAS THERE, Asian Photography Blog, Black Man Ray, and Perú Foto. Today we continue with a look at foCo. Recommended sample post: Miti Ruangkritya, "Imagining Flood"
In a sentence: Spanish-English language site focused on portfolios and interviews with contemporary photographers from around the world, with a slight emphasis on Mexican photographers. foCo is in Spanish, but some interview texts and videos are in English (for example this video with Benoit Paillé) and it's easy to navigate the site's galleries without knowing Spanish. The in-person interview videos are a site highlight. foCo's strength is as one of the few venues for exploring Mexican and Latin American photographers in particular, but the site also features photographers from outside the region. In addition to a focus on portfolios and interviews, foCo also runs infrequent equipment reviews and history-related posts. 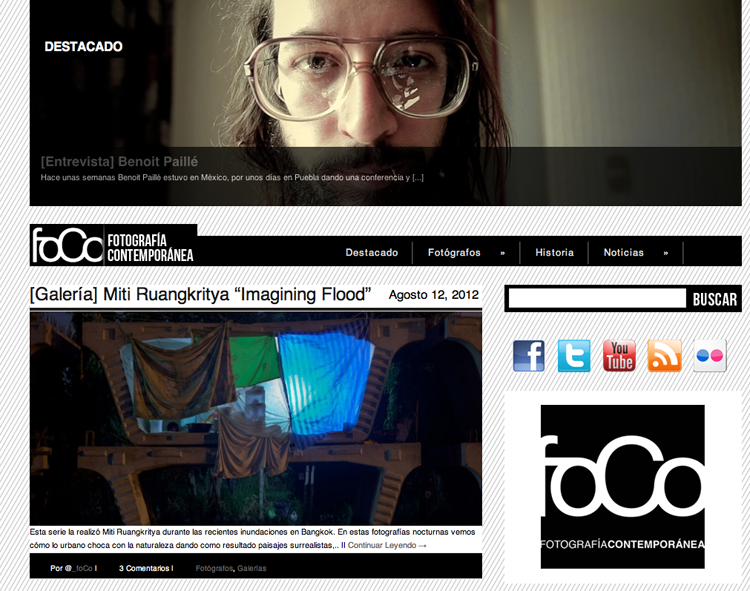 foCo can be found on Facebook and on Twitter.